Go to the extensive Crossroads site on Southwestern humor (University of Virginia). Definitions Southwestern humor is the name given to a tradition of regional sketches and tales based in the "old South-West": Tennessee, Alabama, Mississippi, and Arkansas. According to the Cambridge History of American Literature (volume 2), these tales appeared first in local and then in regional newspapers such as the St. Louis Reveille, the New Orleans Picayune, and the New York journal The Spirit of the Times (630). Politically conservative and linked to the Whig resistance to Andrew Jackson, the writers of this school combined tall tales, thick regional dialect, ironic humor, and a tradition of tricksterism in their stories and sketches. Elements of Southwestern humor appear in the writings of Mark Twain and William Faulkner, among others; see especially Twain's sketches and Faulkner's "The Bear." Arose from the tall tale tradition seen in Davy Crockett (Narrative of the Life of Davy Crockett, 1834) and Mike Fink stories. Characters include the "ring-tailed roarer" or braggart whose mishaps are larger than life and whose solutions are ingenious; the confidence man, and the mighty hunter. Use of dialect, earthy language and incidents, crude physical humor, and cruelty. Conflicts with nature described in a humorous way so as to control the version of the tale and make the wilderness more manageable (stories about bear hunts, etc.). The land itself and its creatures are larger than life, mythical. Often an element of triumphant trickster, or the trickster who is himself tricked or bested in a trade. Use of stock characters: Davy Crockett (old Southwest); Yankee Peddler/Jonathan for the Yankees (Down East humor). In some of these, character of humorist is played off against a character representing an educated or Eastern elite. Almost exclusively a white male literature, written for an intended audience of educated men. The anecdote. 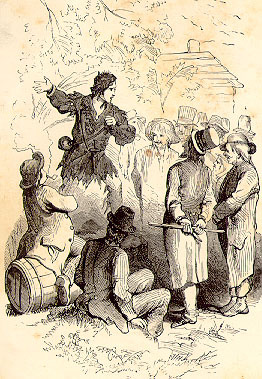 Example: Twain's "The Dandy Frightening the Squatter." 1843-4 Thomas Bangs Thorpe's "Letters from the Far West"
The frame tale. Example: Twain's "The Celebrated Jumping Frog of Calaveras County," Thomas Bangs Thorpe's "The Big Bear of Arkansas.". Johnson Jones Hooper (1815-62), Some Adventures of Captain Simon Suggs, Late of the Tallapoosa Volunteers; Together with "Taking the Census" and Other Alabama Sketches (1845). Campbell, Donna M. "Southwestern Humor, 1830-1860." Literary Movements. Dept. of English, Washington State University. Date of publication or most recent update (listed above as the "last modified" date; you don't need to indicate the time). Web. Date you accessed the page.